Bozard Ford Lincoln has a large selection of Certified Pre-Owned vehicles, allowing Jacksonville area Ford owners to get both peace of mind and used car pricing. For a pre-owned Ford vehicle to become certified as part of Ford CPO, the vehicle must pass a rigorous 172 point inspection, including vehicle history, scheduled maintenance, comprehensive road test, inspection of interior and exterior features, as well as inspection of underhood, underbody, and diagnostic systems. 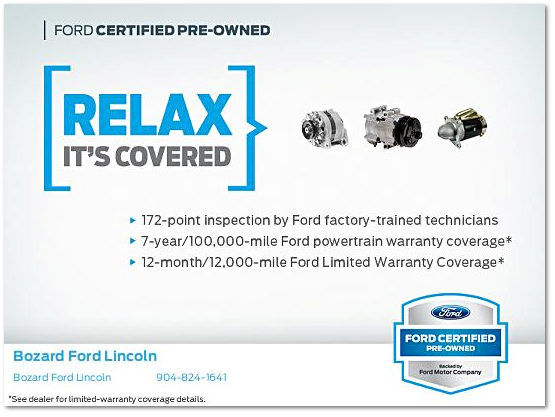 Once a vehicle has been certified as a Ford CPO, the comprehensive limited vehicle warranty covers more than 500 components for 12 months / 12,000 miles * , including engine and transmission, rear and front wheel drive systems, steering, brakes, suspension, A/C, heat and emissions. * See dealer for warranty coverage details. The powertrain limited vehicle warranty covers the engine and transmission for 7 years / 100,000 miles *, offers 24/7 roadside assistance during warranty period and is fully transferable to future buyer at no extra cost. Source: http://www.ford.com/certified-used * See dealer for warranty details.